HealthSouth Corporation (NYSE: HLS) and Motorika Ltd. announced today that the companies have signed an agreement to advance the application of robot technology in HealthSouth's inpatient rehabilitation hospitals. 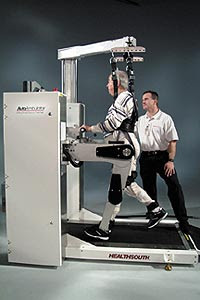 Under the terms of the worldwide agreement, Motorika will have the exclusive license to market and sell the AutoAmbulator®, HealthSouth's robot-assisted gait therapy system and Healthsouth hospitals will install Motrika's Reo(TM) Go platform for robot- assisted arm therapy in at least 25 of its hospitals. Motrika will also take over the manufacture, design, installation, maintenance, technical support, training and distribution of the AutoAmbulator. "This agreement is a defining moment in applying robotic technology to benefit patients receiving therapy for neurological conditions," said Omer Einav, Motorika's founder and chief operating officer. "HealthSouth and Motorika will create a new standard of care for neurological patients, with an integrated full body solution that enables precise levels of functionally- oriented therapy to deliver better patient outcomes." Part of the agreement also includes collaboration on the development of rehabiliataion robots for home use. 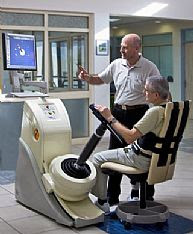 The AutoAmbulator® is a robot-assistance machine that allows patients with neurological conditions such as stroke, multiple sclerosis and spinal cord injury to replicate a normal walking pattern on a treadmill in a safe, efficient manner. Reo Go(TM) is a robotic guide and modular handle, with software to customize exercise patterns and measure performance, to enhance and support the patient upper body rehabilitaion. Such interesting read and information, thanks for sharing this post. I will check back to read your other new posts. Please come visit my site Wisconsin WI Phone Directory when you got time. Such interesting read and information, thanks for sharing this post. I will check back to read your other new posts. Please come visit my site Milwaukee Business Search Engine when you got time.